After our lunch break, our day got more difficult. It was a really hard last 4+ miles because they were mostly on cement sidewalks or streets, which was very hard on all of our knees and feet, especially with 17+ miles on the legs already. The boys were champs though, and we were feet up in our hotel by 3:15. We met some interesting and wonderful people. Iris, from Taiwan, who is 30, and quit her corporate job to walk the Camino and “meet God.” She said it happened on the first day. The people were fabulous and the scenery, beautiful!!! It was a day full of meaning and I will never forget it. I am so thankful for my family, and feel blessed to be doing this! Up next: a 16-mile day tomorrow that will mostly be flat to rolling. Rain is definitely in the forecast so it may be more mental than today and not as photo-worthy… Glad we have some hours to rest! Here are several photos captured along today’s trek, along with two videos. Thanks for reading, and I hope you’ll check back for a blog about tomorrow’s trek, which will be one of our most ambitious days. Our first day on the Camino de Santiago pilgrimage. This was during first light. Family photo by Cruz de Ferro, a very meaningful part of our journey. 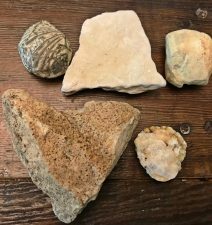 The heart rock I found on a training hike in Wyoming, that I left behind (along with a “burden”) at the Cruz de Ferro, on the Camino de Santiago. 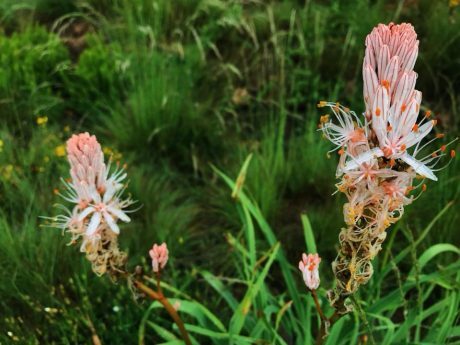 Hiking in the mist, among wildflowers. A memorial. I love the epitaph on the grave. We said a prayer for the man, who died too young. 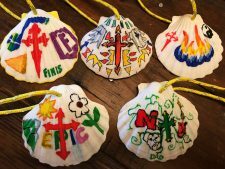 The scallop shell is the symbol of the Camino de Santiago. 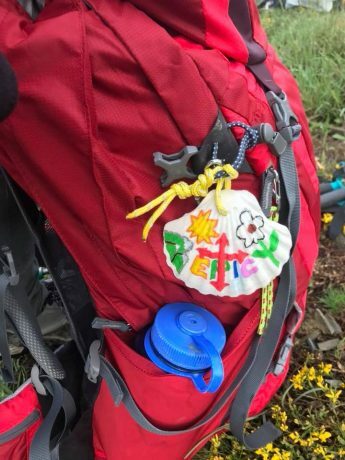 Pilgrims wear a shell on their backpack, and all the Camino signs have a yellow scallop shell on them. When we committed to the epic adventure, we bought shells then drew names and designed/painted the shell for the person whose name we drew. Fin drew my name and designed my shell. I love it so much! 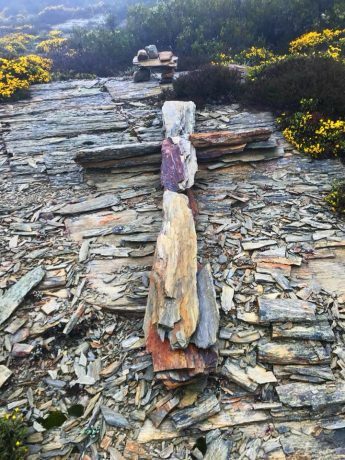 A cross someone made alongside the trail. It was a beautiful trek today that often took us through lush greenery like this. It was love at first sight. That’s the only way I can describe my first impression of Spain. And I don’t want to speak for my family members, but I’m pretty sure they are in love, too. Hola! This sangria was Epic. Our cab delivered us to a corner near our hotel. 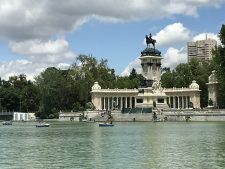 I immediately fell in love with Madrid! The narrow, cobblestone streets were filled with people. The tall buildings are beautiful and old, with shutters and planters full of flowers hanging from every balcony. As we worked to maneuver ourselves and our abundant luggage through the crowded streets, people were friendly and welcoming. 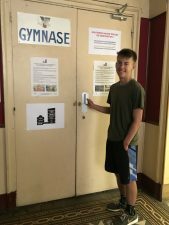 As mentioned in the last blog post, one of the things about these big international trips that we find particularly exciting is discovering our accommodations at each new destination. Our flat in Paris was awesome, but there was no air conditioning. I don’t mean to complain, but it was a little on the warm side. Right away, upon entering our Madrid hotel room, we noticed the cool air. Our room was small but classy. Beautiful linens, and an awesome location – right in the heart of central Madrid, surrounded by Tapas bars, and one minute from Plaza Mayor, and several wonderful shops and bakeries. After dumping our bags, we took to the streets. We had one thing on our minds: Food. And not just any food. We were on the hunt for Tapas. A tapa is an appetizer or snack in Spanish cuisine and translates to a small portion of any kind of Spanish cuisine. 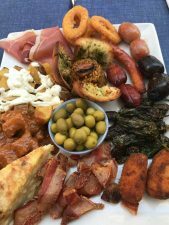 Tapas are a traditional way of eating in Spain. We are trying to immerse ourselves in the culture of each city and/country we’re visiting. We didn’t have to work very hard to find tapas. Lucky for us, there were about a hundred within easy walking distance from our hotel. We opted for a platter that included olives, sausage, ham, tortilla, calamari, garlic toast, cheese, and more. The boys all ordered Fantas, Jerry had a cerveza and I had a sangria (duh!). 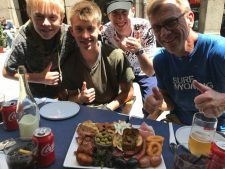 Our first tapas in Spain. Epic yum! Epic yum is all I can say. The food was out of this world delicious, and so was the sangria. We were serenaded by an accordion player as we finished licking our plates. Thumbs up all around for tapas! Next, we found Plaza Mayor, which is Madrid’s main square. The square was originally planned by Felipe II and his architect Juan de Herrera, but was inaugurated in 1620 during Felipe III’s reign. In the middle of the square is a spectacular statue of Felipe III. Juan Gómez de Mora gave it its rectangular form, and after it had suffered three fires Juan de Villanova completed the work in 1853 by joining the four sides. There are several tapas bars and restaurants in the Plaza, and we watched a great variety of street performers. Family selfie in Plaza Mayor. 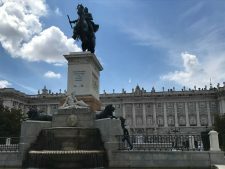 We were energized and wanting to see more so we headed for Palacio Real de Madrid (or, the Royal Palace of Madrid). The Palacio Real is Madrid’s largest building, and the largest royal palace in Western Europe. The palace was built on the site of the old Alcázar, the Moorish castle destroyed by fire in 1734. The palace was initially designed by Filippo Juvarra to accommodate the court of Felipe V, a total of more than 3,000 courtiers. Juan Bautista Sacchetti initiated the building project in 1737, and Francisco Sabatini and Ventura Rodríguez terminated the works. It is surrounded by the beautiful Sabatini Park, and neo-classical Sabatini Gardens, and Campo del Moro parks. Here, there were many street performers. We love street performers. It was one of our favorite aspects of our visit to Rome a couple of years ago. At the Palace Real, there was a spectacular harp player, and also a guitar player. 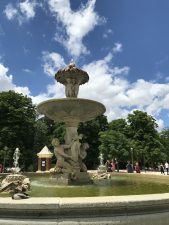 We lingered and enjoyed the performances while taking in the sights of the palace and the many statues, and the fountain. 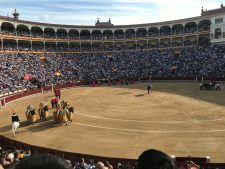 The opening parade of the bull fight at Plaza de Toros de Ventas. One of the events the boys were anticipating was the bull fight. Madrid is home to Plaza de Toros de Ventas, one of the most prestigious bull rings in the world. Situated in the Guindalera quarter of the district of Salamanca, it was inaugurated on June 17, 1931. It has a seating capacity of almost 25,000. The bull ring has five gates from which the bulls enter the arena. According to Wikipedia: From 1913 to 1920, the national passion (bullfighting) gained such an important status that Madrid’s former main bullring in Carretera de Aragón was not big enough. 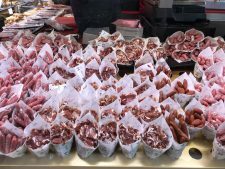 It was José Gómez Ortega “Joselito” who declared that a new “monumental” bullring had to be built, to open this part of Spain’s heritage and culture to the whole city of Madrid. His friend the architect José Espeliú began to work on the project. A family called Jardón donated the land to the Madrid Provincial Council, provided that they could run the arena for fifty years. The deputation accepted the proposal on November 12, 1920. On March 19, 1922, in the exact center of the prospective arena, the first stone was placed. The construction of the bullring would cost 12 million pesetas (4.5 million over budget), and it would replace the old bullring, dating from 1874. “Las Ventas” was finished in 1929 and two years later, June 17, 1931, a charity bullfight was held with a full-capacity crowd to inaugurate it. Bullfighting stopped during the Spanish Civil War and did not resume until May 1939. The boys, giddy at all of the Spanish candy and savory snack choices at the concession stand outside of the bull fighting arena. 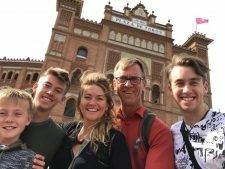 Family selfie in front of the beautiful Plaza de Toros de Ventas, in Madrid. We rode the Metro seven stops to get to the bullring. What a spectacular venue! The exterior is beautiful, and we were, as usual, plenty early. 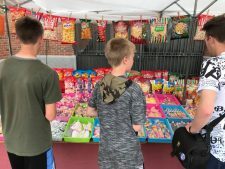 So we stopped at the many vendors outside, including a concession stand where the boys had a blast filling a big bag with assorted local candies and chips to feast on during the bull fight. Once inside, it was exciting. There were kegs of beer lining the walls, and bars everywhere. We found our seats. When we bought the tickets 24 hours earlier, the bullring ticket site indicated there were fewer than 100 tickets remaining. I didn’t believe it at the time, instead thinking it was a ploy to create a frenzy and pressure people into buying tickets. But it appeared to have been the truth. It was a packed stadium. Close to 25,000 people packed the stunning arena. 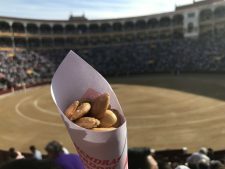 Sunflower seeds and local nuts are one of the most popular treats at the bull fight, and we could understand. Jerry and I love sunflower seeds, and have our favorite brand that we indulge on road trips. We loved the local seeds. An interesting note about the sunflower seeds, Jerry and I remarked at the slight sound of “clicking” we could hear. It sounded a little like crickets or some other insects, but upon closer listening, we realized it was thousands of people chewing on sunflower seeds. Call me a dork, but that was the first time I ever heard such a thing. 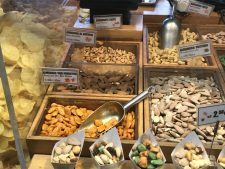 We also bought some locally-grown freshly roasted and salted almonds. They were the best almonds I’ve ever had, and I hope we’ll come across them again during the rest of our time in Spain. The best almonds I’ve ever had. The bull fight was exhilarating! There is no other way to put it. Yes, it was also bloody. I had no knowledge about what all happens at a bull fight. 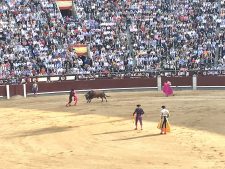 All I knew is there would be bull fighters taunting bulls and “fighting” them, but I had no idea how it worked. I wish I had the time to explain in more detail the bull fight, but I’m short on time. I have to get prepared for our Camino de Santiago pilgrimage, and the bullfight experience deserves more than a rush job. 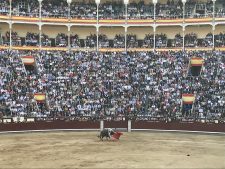 So, I’m including some photos here in this post, but I hope you’ll check back in a month or so, at which time I hope to have a more in-depth blog post about the bull fight experience, including videos, etc. After riding the Metro back, there was a fantastic singer and guitar player in the station we listened to for about 15 minutes before finding a new route back to our hotel. People and energy and music filled the air, as we navigated the narrow streets. Performers were everywhere, and by the time we returned to our hotel we had enjoyed a great variety of music provided by didgeridoo, accordian, harp, guitar, and violin. I can’t believe what happened next. We slept in until 11:28! I don’t think I’ve ever slept that late, even when I tried. And Jerry is the earliest riser in our family who never sleeps late, and he, too, slept until almost 11:30. None of us could believe it when we saw the time. That really hit the spot! I’m sure it had to do with several things, including a perfectly temperature-adjusted room, wonderful linens, comfortable beds, super full stomachs, and days of travel and jet lag residual. But, also, I think it’s indicative of how comfortable we felt in Madrid. Since we slept through breakfast, the boys wanted to know, What are we doing for lunch? 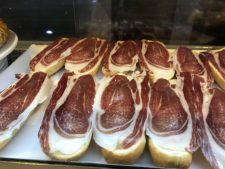 We had heard rave reviews about a place called Mercada de San Miguel, which as our great luck would have it, was just a stone’s throw from our hotel. Oh my God. The rave reviews are legit! 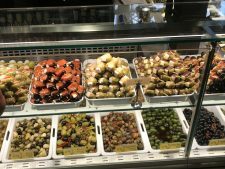 The gazillion choices of foods all looked delicious enough to die for, and it was difficult for each of us to narrow our choices. 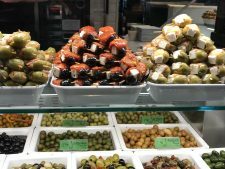 All told, between us all, we had Squid tentacles in a cup, Calzone, a fancy calamari sandwich, a chicken kabob, olives, nuts, crab cakes, Iberian ham croquettes, sausage and patatas. It was all so delicious, and so reasonably priced. Campanillos fountain, Buen Retiro Park. We strolled back to our digs, and got cleaned up before going out for a delicious dinner of seafood paello, Iberian ham, croquettes and a cheese board. We closed in early because the next day would start early. Plus, we had lots of final organizing to do. 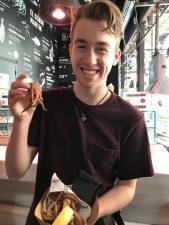 In the morning, we would ride a bus for 4 hours to Astorga, then get transported by cab to Rabanal de Camino, at which point we’d have only our backpacks and we’d part way with the bulk of our luggage. The Camino de Santiago pilgrimage has been approaching for some time, and now it is finally right upon us. Our introduction to Spain has been nothing short of fantastic, and we have fallen in love with Madrid. Right as our heads were hitting our pillows, we heard some soft classic guitar music. It was beautiful, and our musician son, Wolf, jumped out of bed to go see the musician, who was playing right below our balcony. About 15 minutes later, Wolf returned to request some money to offer the performer. I couldn’t resist, and joined Wolf to listen for another song or two. I want to make sure to write this sensitively. The musician didn’t have a right hand. He had a hook for a hand. He is an amazing musician and artist, and watching him pick and play such beautiful music with just five fingers was astonishing and inspiring to no end. I hope you’ll watch the video clip below. Thank you, Madrid, for an unforgettable introduction to Spain, and your great city! Next up, Rabanal de Camino, and the Camino de Santiago trek! Thanks for reading, and I hope you’ll check back again soon. It takes a while to get from the Frontier of Wyoming to Paris, France. After our 5.5-hour drive from Lander, WY to Denver, we flew for 3.5 hours to NYC/JFK, before catching a 7-hour flight to Paris. But as is always the case, the long haul was worth it. Our reserved transportation was waiting for us at the baggage claim, and our adventure started. It was 7am, and our driver was zooming us in and out of traffic lanes. Just our ride in the traffic of Paris was exhilarating, and served to wake us all up out of slumberous states. One of the exciting parts of these big international trips is when we arrive at a new destination and we get to see what our accommodations are like. Jerry picked this apartment/flat out months ago, and he did a great job! We are enjoying a spacious apartment on Rue Cadet that is right in the heart of Paris. Our windows are open and we hear the life of Paris almost constantly. After taking long naps, we set out on foot to see what all the fuss of Paris is about. We walked about a mile and a half to reach the Seine River, and get our first spy of the Eiffel Tower. 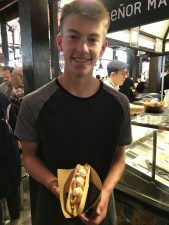 Of course, along the way, we also indulged in baguettes, chocolate croissants, and the much-anticipated Nutella-filled crepes. 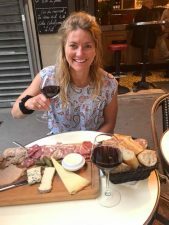 We ended our first day in Paris early due to sleep deprivation and jet lag, but not before enjoying an epically delicious French dinner at a sidewalk cafe near our flat. The next day was a big one. We had a day full of tours planned, including the Louvre, Notre Dame, and a cruise on the Seine. 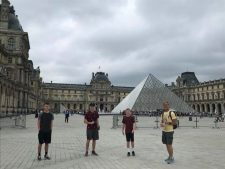 Jerry and the boys at the Louvre. We saw so many famous works of art, including Aphrodite of Milos, better known as the Venus de Milo. Venus de Milo is an ancient Greek statue and one of the most famous works of ancient Greek sculpture. Initially it was attributed to the sculptor Praxiteles, however from an inscription that was on its plinth, the statue is thought to be the work of Alexandros of Antioch. Created sometime between 130 and 100 BC, the statue is believed to depict Aphrodite, the Greek goddess of love and beauty (Venus to the Romans). It is a marble sculpture, slightly larger than life size, stands 6′ 8″ high. Part of an arm and the original plinth were lost following its discovery. She used to have real gold jewelry. It is currently on permanent display at the Louvre Museum in Paris. The statue is named after the Greek island of Milos, where it was discovered. 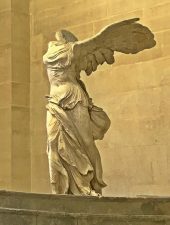 Another highlight of our tour of The Louvre was seeing the Winged Victory of Samothrace, also called the Nike of Samothrace, is a marble Hellenistic sculpture of Nike (the Greek goddess of victory), that was created about the 2nd century BC. Since 1884, it has been prominently displayed at the Louvre and is one of the most celebrated sculptures in the world. H.W. Janson described it as “the greatest masterpiece of Hellenistic sculpture”, and it is one of a small number of major Hellenistic statues surviving in the original form. We also saw the Mona Lisa! Considered the world’s most famous painting, Mona Lisa is an oil painting on a poplar wood panel by the Italian painter, draftsman, sculptor, architect, and engineer Leonardo da Vinci. It was painted sometime between 1503 and 1519, when Leonardo was living in Florence, and it now hangs in the Louvre, in Paris, where it remains an object of pilgrimage in the 21st century. This portrait was started in Florence around 1503. 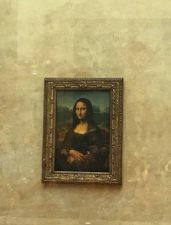 It is thought to be of Lisa Gherardini, wife of a Florentine cloth merchant named Francesco del Giocondo – hence the alternative title, La Gioconda. However, Leonardo seems to have taken the completed portrait to France rather than giving it to the person who commissioned it. After his death, the painting entered François I’s collection. Mona Lisa was stolen and the media reported on it so much that the painting is even more famous. (Someone is in the room for 24 hours a day. 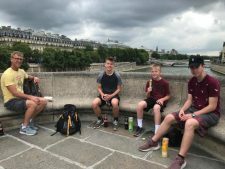 After our morning tour of The Louvre, we enjoyed a quick snack and break on one of the 37 bridges that span the Seine in Paris. Jerry and the boys, taking a snack break in between tours. 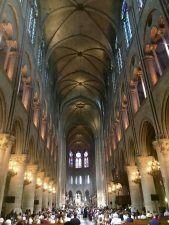 Next up was a tour of Notre-Dame de Paris. We were looking particularly forward to this tour, not only because we have wanted to see Notre Dame, but also because our tour guide would be Georgia Darell, who led us on an exceptional tour of the Catacombs during our trip to Rome two years ago. We’ve stayed in touch with Georgia, and she’s become a friend of ours, so it was extra special to see her again. And, no surprise, she provided us with an unforgettable tour of Notre Dame. Notre-Dame de Paris (meaning “Our Lady of Paris”), also known as Notre-Dame Cathedral or simply Notre-Dame, is a medieval Catholic cathedral in Paris that is widely considered to be one of the finest examples of French Gothic architecture. Notre Dame is among the largest and best-known church buildings in the Catholic Church in France, and in the world. 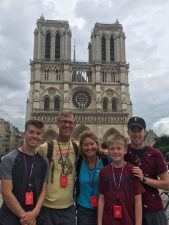 Family photo in front of Notre Dame. 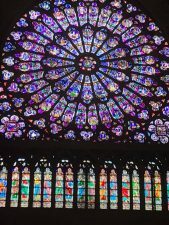 This spectacular stained glass in Notre Dame dates back to the 1300s. We found our good friend, Georgia Darell, in Paris! She led our Catacombs tour in Rome 2 years ago. It was fantastic to meet up again, and she provided us with an exceptional tour. After the Notre Dame tour, we went out to coffee with Georgia. It was so funny–our youngest son, Fin, 11, kept falling asleep while sitting upright in his chair at the cafe. We are all a little sleep-deprived and jet-lagged still, not to mention my FitBit reports 10 miles today. 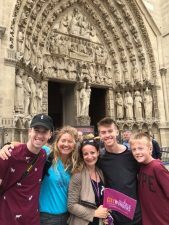 While walking to meet up for our cruise on the Seine, we admired the spectacular Hôtel de Ville de Paris, and various street performers. We walked all the way around the hotel to admire it. The Hôtel has been the seat of the Paris City Council since 1357. The current building, with a neo-renaissance style, was built by architects Théodore Ballu and Edouard Deperthes on the site of the former Hôtel de Ville which burnt down during the Paris Commune in 1871. We ended our day of sightseeing in Paris with a cruise on the Seine River. The Seine is a 483-mile-long river and an important commercial waterway within the Paris Basin in the north of France. It flows through Paris and into the English Channel at Le Havre (and Honfleur on the left bank). It is navigable by ocean-going vessels as far as Rouen, 75 miles from the sea. Within Paris, there are 37 bridges that cross the Seine, including the Pont Alexandre III and Pont Neuf, the latter of which dates back to 1607. 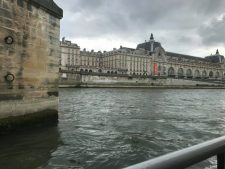 From the Seine, we enjoyed great views of all of the City’s major attractions. Everything I needed after the full day. 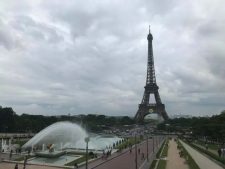 We are writing daily in our family journal, and by all indications from today, and each of our family member’s journal entries, it is fair to say we love Paris. What a magical day in the City of Lights. By the way, for two nights in a row, I have been awakened at around 3:45am. What woke me up? Silence. It’s only brief here, and at least from what we can gather from our flat, Paris sleeps for about 30 minutes and it’s from 3:45am-4:15am. 🙂 It is fun to be in such a lively, energized city. Our final day was supposed to include a tour of the Catacombs of Paris, which we were so looking forward to. However, the workers are on Strike so that tour was a No Go. (We feel lucky that we toured the Catacombs in Rome a couple of years ago, so we at least have an idea for the kind of experience we missed.) And even though we’re bummed, after talking to locals, we understand the workers’ concerns. We made the best of it by sleeping in late, walking all over and exploring areas of Paris we hadn’t yet explored, found a “street piano” for Wolf to play, toured a mall, found epic gelato at Amorino, and swung another strike when, in the interest of our son, Hayden, we found the location of the world’s oldest basketball court. And – you guessed it–it was not to be. It is currently closed for renovations. 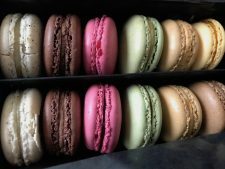 We consoled ourselves by treating ourselves to a dozen Ladurée macarons – the best in Paris! 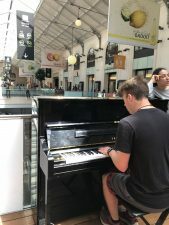 Wolf Googled “street piano,” and we found this one in a mall. We are chillin’ in our flat and will treat ourselves to a final French dinner before closing in at a reasonable hour. 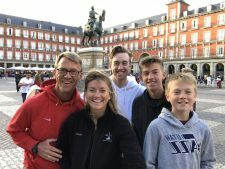 Tomorrow we depart, super early, for Madrid, as we start to orient toward the main event of this Epic trip – our Camino de Santiago pilgrimage, which will begin in a few more days. Epic yum x 12. Macarons Ladurée. All is well when you find epic gelato! Our Epic family trip is fast approaching, and we are so excited! 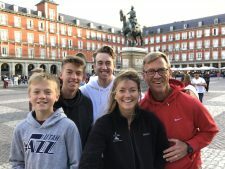 We’ll spend a few days in Paris, then we’ll fly to Spain, where we’ll start out in Madrid for a couple of days, before embarking on the main part of our Adventure – our 160-mile pilgrimage on the Camino de Santiago. We’ll mark the end of our pilgrimage in Santiago de Compostela, before flying to Barcelona to celebrate the last four days of our Epic trip. Four years ago, my husband, Jerry, and I resolved that we – our family – were going to start taking almost-month-long vacations. We have three sons, Wolf, 18, Hayden, 16, and Fin, 11. We have always enjoyed many family trips and adventures, but, until three years ago, we had never gone on a trip that lasted more than 7-10 days. What a gift it would be if we could take an entire month to experience new places, sights, cultures and activities as a family. As a parent, I doubt myself often. I don’t boast a lot about my parenting abilities, but this idea is one I’m so proud of, and as parents, it’s definitely one of the best ideas Jerry and I have had. Family selfie. That’s our dog, Buddy. Some people may wonder how we can take a month off to make a trip every year. That’s a good question. It’s not easy, and it hasn’t always been possible. Our ability to do so is hard-earned and intentional. Having the time available is a gift. For us, time is worth more than money. Jerry’s a teacher, so he and the boys all get out of school at the end of May each year. Jerry didn’t always have his summers free, though. When we had our first company, Yellowstone Journal and YellowstonePark.com, for 15 years (from 1994-2008), Jerry’s summers were spent working tirelessly delivering magazines and helping me with the company. He worked so hard for so many years, logging endless hours and miles on the road. Fortunately, since selling that company in 2008, Jerry’s summers have been his. As for me, I work for myself, and since starting Epic Life Inc. in 2011, I have kept my summers mostly free. That said, it would be easy to not embark on these trips. 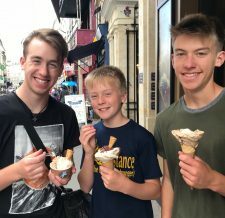 They are big undertakings, especially when they’re a month long and involve international travel, and a family of five that includes three growing boys with insatiable appetites for food. It would be easy to chicken out and say No. But we want to say Yes, so we book them far in advance, when we’re initially inspired, so we can’t draw back. In 2016, we made our first international trip and explored several countries in Europe. It was an unforgettable experience that included time in London, Munich, Switzerland, Italy (Moneglia and Rome, etc. ), and Portugal. 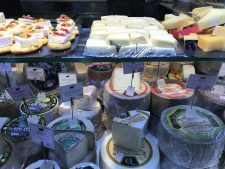 We visited numerous historic and cultural sites, hiked many miles in Switzerland and Italy, drank beer and wine, indulged in the many delicious and unique foods of the countries, and met so many kind and interesting people. Plus, we successfully made about 100 train connections, which is no small feat for these country bumpkins from Wyoming! 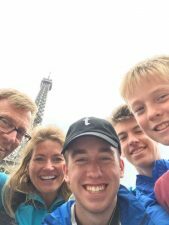 We kept a family journal, and each of us wrote something at the end of each of our 30 days in Europe. Each of us walked, on average, 13 miles per day, which is indicative of how much we saw and experienced. Every time we arrived to a new destination, by train, we’d hike 1-3 miles to discover what our accommodations would be like. It was all new and exciting and unforgettable, and to do it all as a family, was/has been such a blessing. Then, last year, in 2017, we started in Vancouver, B.C., where we rented a van and enjoyed a month-long Epic Road Trip that took us all the way south to Los Angeles. From Vancouver to the San Juan Islands to Seattle, to Portland, to the coasts of Washington, Oregon and California, we immersed ourselves in the cultures of the cities, the wonderful environs of several national parks and beaches, and had another unforgettable adventure. We still revisit, often, various aspects of both of our Epic trips, which, of course, is what Jerry and I were hoping for when we had this idea of the longer family trips. We wanted for us to create lasting memories and experiences that our family would be able to share forever. Before continuing, I ‘d like to be completely transparent about something. I would be lying if I said these big trips, and the destinations we choose, have been family decisions. For the most part, they haven’t included a very democratic process. Rather, for the most part, Jerry and I have determined where we’d like to take the family, and then we share our dreams of the particular travel plans, and, at least so far, the boys have been excited and quickly jumped on board. By the way, whenever it has come to something Jerry and I feel strongly will benefit our family, we have used this tactic. For example, when we first started our family, Jerry and I resolved that we wanted to be an outdoors family. 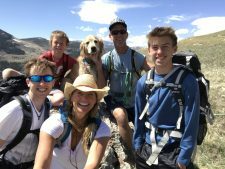 I wrote an article, called “How to get your kids to hike” that explains how we went about raising an outdoors-oriented family. But for purposes of the point I’m trying to make here, I’ll cut to the chase. 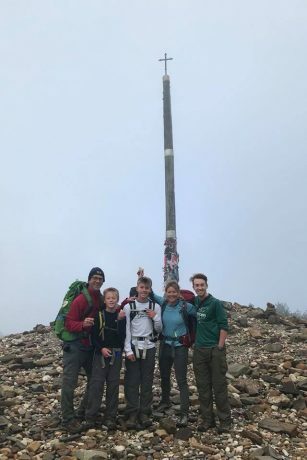 Whenever we wanted to take the kids hiking, we did not ask them, “Do you want to go hiking today?” Instead, we’d enthusiastically announce to them, “Today, we’re going hiking!” This simple strategy worked, and today our boys are great hikers, and we’ve spent the last 18 years adventuring with them. When it comes to goals and values you’d like to instill in your family, I highly recommend this strategy. 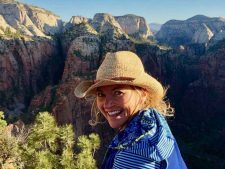 We are the “captains” of our families/kids for only so long, and Jerry and I are trusting that the decisions around travel and outdoors that we have made for our boys, and our family, will offer them lasting benefits. Our boys are big hikers and quite experienced when it comes to the outdoors. Most of our trips and adventures include hiking and/or camping. 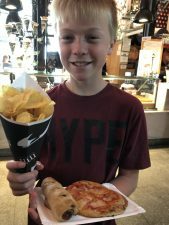 In Switzerland, we had two different day hikes that were about 20 miles each, and the boys, as long as we fed them often and generously, were champs! Over the years, we’ve taken them on backpacking trips, but those have been no longer than 3-4 days each. 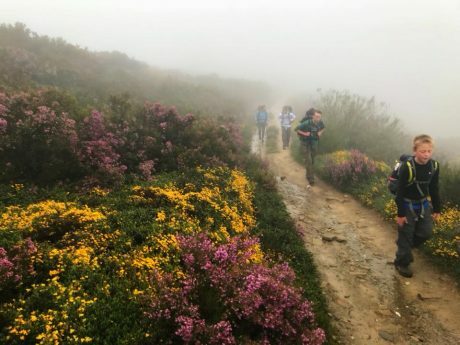 This trip’s pilgrimage on the Camino de Santiago will include 11 days of nothing but trekking. Day after day of nothing but walking. Some of our days are big, including our first and third, which will be 20-plus miles each. The other days range from 12-16 miles. 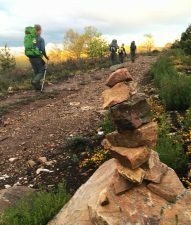 So we’ve been training for the occasion, and these training hikes have added to the experience as we’ve had some memorable times in our “backyard,” the foothills of Wyoming’s Wind River Range. Jerry and the boys, and our Buddy, on a training hike. Why make trekking the Camino de Santiago a part of our big trip this year? For starters, we can credit Martin Sheen and his son, Emilio Estevez. About six years ago, Jerry and I rented the movie, The Way. The movie, written and directed by Estevez, and starring Martin Sheen, is about a father who travels overseas to recover the body of his estranged son who died while trekking the El Camino de Santiago, and decides to take the pilgrimage himself. The movie is fantastic, and after seeing it, Jerry and I were both inspired to someday make the pilgrimage ourselves. Then, in recent years, and months, I’ve read books, and blog posts, and social media posts by people on pilgrimage. 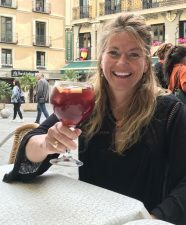 Friends, and friends of friends have shared photos and videos and personal accounts that have all re-inspired me about the Camino de Santiago. Various friends I know from my small town of Lander, WY, and the surrounding area, made the pilgrimage as recently as last year and have inspired us. 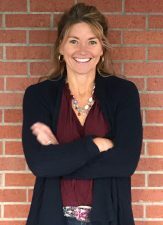 Laureen Lund has a fantastic blog that includes her daily accounts of the experience. The best documentary, in my humble opinion, is Walking the Camino. We also read the book, and watched the documentary called I’ll Push You, which I highly recommend, whether you have interest in the Camino or not. Other great books I’ve read are The Pilgrimage, by Paulo Coelho, Pilgrim Strong: Rewriting my story on the way of St. James, Sunrises to Santiago: Searching for purpose on the Camino de Santiago, as well as others. All of these have stoked the fire in me that was started when I originally learned about the Camino. A pilgrim is a person who journeys to a sacred place. The Camino de Santiago is certainly a sacred place. 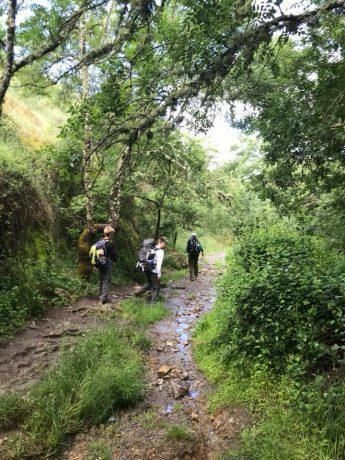 Often referred to as The Way of Saint James, the Camino de Santiago was one of the most important Christian pilgrimages during the Middle Ages. Legend has it that the remains of Saint James the Great, one of the apostles of Jesus Christ, were carried by boat from Jerusalem to northern Spain, where he was buried in what is now the city of Santiago de Compostela. Once to Santiago, pilgrims often celebrate mass at the spectacular Cathedral of Santiago de Compostela, which marks the traditional end of the pilgrimage route. Certainly, to walk where millions of others have walked before us in the interest of searching for meaning and to deepen their faith or spirituality will be such a unique experience, and an honor. I’m excited to be a pilgrim, and for my family to be pilgrims, even if it’s for only 11 days. A pilgrimage is a journey. 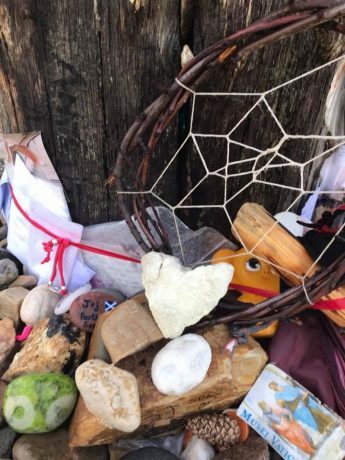 (In my work – whether in my coaching, or my epic adventure guiding – I’m often trying to lead my clients on an inner pilgrimage. A journey to discover more about themselves, and to, in the process be open to exploring and taking chances.) I know firsthand, and also from my observations of those I work with, how powerful such a personal journey can be. I’m excited beyond words to be embarking on a pilgrimage as a family. 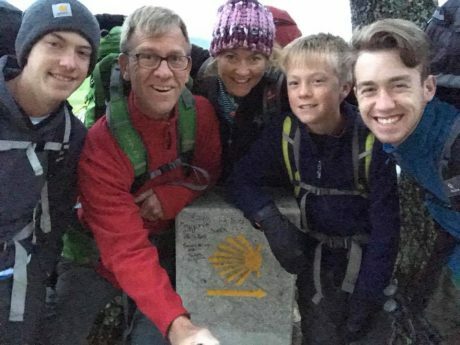 The pilgrimage has the opportunity to transform our family in some way, while affecting each of us individually in unique ways. For days, our only objective will be to put one foot in front of the other. While it will certainly at times be physically challenging, the other aspects of the pilgrimage are what really intrigue Jerry and I. 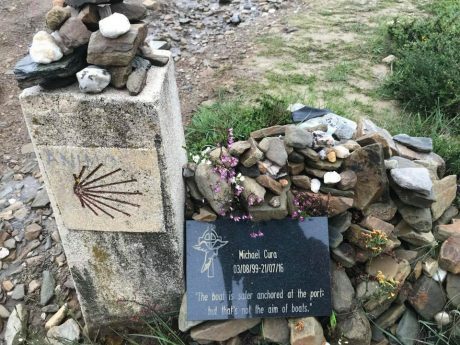 Many follow a route of the Camino de Santiago as a form of spiritual path or retreat for their spiritual growth, or any number of very personal meanings. The Way can take one of dozens of pilgrimage routes to Santiago de Compostela. Traditionally, as with most pilgrimages, the Way of Saint James began at one’s home and ended at the pilgrimage site. However, a few of the routes are considered main ones. We will be following the Camino Francés – or, The French Way. During the Middle Ages, the route was highly travelled. (In the 14th Century, a million pilgrims from throughout Europe wold make the pilgrimage every year.) However, the Black Death, the Protestant Reformation, and political unrest in 16th century Europe led to its decline. By the 1980s, only a few hundred pilgrims per year registered in the pilgrim’s office in Santiago. In October 1987, the route was declared the first European Cultural Route by the Council of Europe; it was also named one of UNESCO’s World Heritage Sites. Since the 1980s, the route has attracted a growing number of modern-day international pilgrims. Today, about 300,000 pilgrims from throughout the world make the pilgrimage each year. From here on out, I’ll take the lazy route and include some particulars about our journey in the form of bullet points. Feel free to leave a comment if you have questions about anything that might be of interest that I have overlooked. • Then we’ll fly to Madrid, a city we will explore for two days. • On June 5, we’ll send most of our luggage off, to be transported to the end of our journey, and we’ll head to Astorga. Our pilgrimage will begin on June 6. • The entire Way is 790km/490 miles. Many people take 30-50 days to walk its entire length. Others will do a portion of it, and return in future years to complete the entire path. 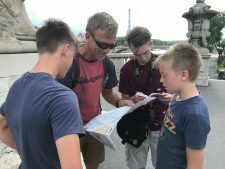 As for us, and this trip, we’ll be dedicating 11-12 days to our pilgrimage, and we’ll walk about 160 miles. 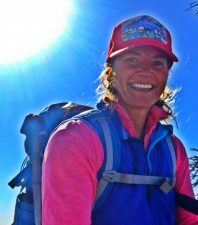 • It’s a good thing we’re from high country in Wyoming, and that we’re hikers because we will have some big days, including days 1 and 3, when we’ll walk about 22 miles. Other days will be 12-16 miles each. 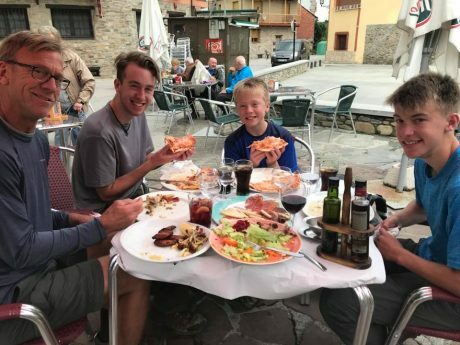 • Staying in the albergues/hostels are a big part of the Camino de Santiago experience. I understand that. But we have instead opted to stay in Inns along the way. We have reserved private accommodations for our nights along the Camino. This may seem less adventurous, but after reading accounts of “100 snorers,” our decision was made. I already have 4 personal snorers with me, but also, in addition, due to some of our big mileage days, having some personal space each night feels important to us. • We’re looking so forward to all of the people we meet along the way, and to hearing their stories, and to sharing such a meaningful experiences with “strangers” who are from all over the world. We are each/all likely to make some new friendships. • I used to know Spanish pretty well. I took Spanish in high school and for two years in college. Unfortunately, I don’t remember much of it, so I have been using the Duolingo app to learn some words and phrases. Wolf and Hayden are pretty good at Spanish, and they are looking forward to trying their best to use the language. We will rely on them to help us communicate our needs along the path, and in Madrid and Barcelona. That will be fun. • Each of our family members has a “Credencial de Peregrino.” This document dates back to the middle ages, when it was given to pilgrims as a safeguard. This Credencial is only for pilgrims on foot, bicycle or horseback, who wish to make the pilgrimage with a Christian sentiment, even if it is only with an “attitude of search.” The Credencial has the purpose of identifying the pilgrim, provides access to hostels offered by the Christian hospitality of the Way, and to serve as certification in applying for the “Compostela” at the Cathedral of Santiago, which certifies you have made the pilgrimage. Each of us will collect two stamps on our Credencial at every village, etc., we pass through. • We will end in Santiago de Compostela, so we’re starting about 160 miles out from there, near Astorga. We are looking forward to celebrating our pilgrimage’s end in Santiago, where we’ll stand in line to get our stamped Credencials validated and receive certificates for our pilgrimage. • At Santiago, a highlight for us will be to attend mass at the extraordinary Santiago De Compostela Cathedral. I can imagine it will be one of the most meaningful and unforgettable masses we’ve ever attended. One of the most interesting elements about the cathedral is the famous Botafumeiro, a large censer which disperses incense amid the congregation. Weighing 117 pounds and measuring 5 feet, it is one of the largest in the world, and is suspended 65 feet high above the crowd via a system of ropes and pulleys. On special occasions, and after some masses, the Botafuemeiro is released by team of eight tiraboleiros who swing it across the cathedral at great speeds of up to 42 miles/hr). • It is thought that this tradition of spreading so much incense over the mass was started in order to cover up the smell of the thousands of pilgrims arriving at the cathedral after their exertions. We’ll soon be among those sweaty pilgrims, and I am pretty certain the incense will be a most welcome scent! Finally, the Camino de Santiago pilgrimage will surely present us with challenges and blessings. What the journey will mean for each of individually and as a family is a mystery. And I love that it is. We will see new landscapes on this adventure, but we are also sure to return with new eyes. Thank you so much for reading this blog post, and following along, as I blog from The Way. I really appreciate your stopping by and taking an interest. Truly.